Last weekend Mel hosted her 4th Annual Cookie Exchange! Over the years this exchange has gotten yummier and yummier as the ladies have become more competitive with their recipes. More than 17 types of cookies came to the party and each girl baked 4 dozen so Mel’s home was filled with more than 816 (!!!!) cookies! The cookie I voted for — peanut butter fudge! Mel’s famous ho-ho punch: Combine 1 bottle of chilled champagne, 1 bottle of chilled ginger ale, and 2 packages of frozen strawberries, partially thawed. And at the end of the party each girl took home a huge bucket full of treats. Last year I made Graham Cracker Toffee for Christmas gifts and it was such a big hit I wanted to make it for Mel’s party. 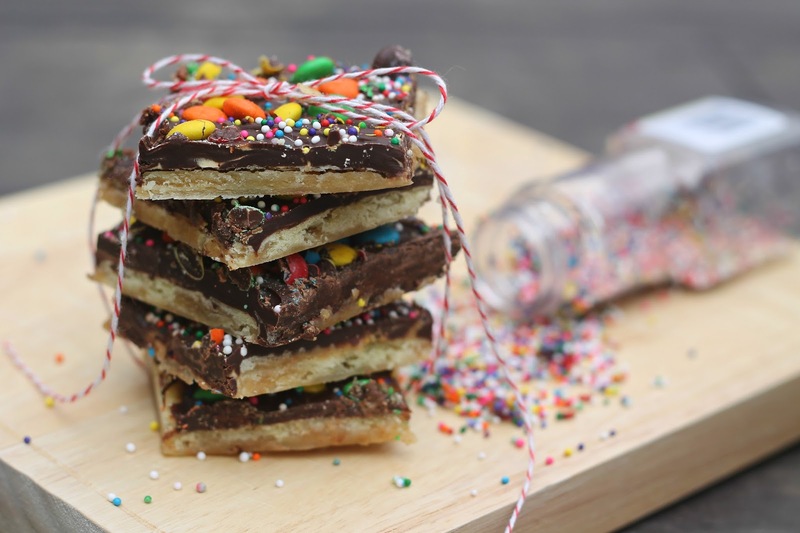 However, I decided to tweak the recipe a bit by swapping out graham crackers for saltine crackers, added a delicious layer of peanut butter and topped them with M&Ms and sprinkles! Oh, and there’s a splash of toddler love in there too. to break a few into smaller pieces. Set aside. constantly. Let the mixture boil for about 2 minutes. minutes or until the butter mixture is bubbly. 5. While toffee is baking, heat peanut butter in microwave until melted. chocolate is melted, then use a spatula to spread the mixture around. 7. Let sit for about two hours or chill for 30 minutes. Cut and enjoy! 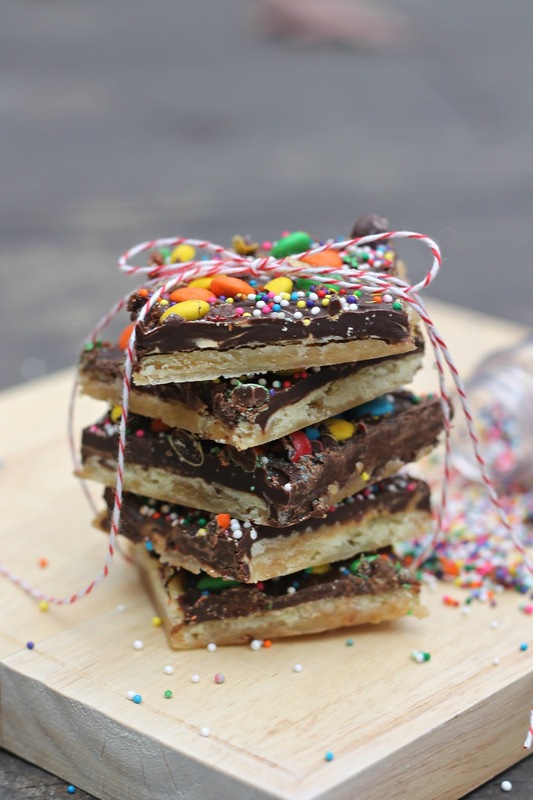 Print recipe for Saltine Cracker Toffee. What a fun night! Love that there were so many savouries to balance out the sweet. What a fun idea!! I love how you do so many neat get-togethers with your friends! Your cookie looks delicious! yummy yummy!! I'm always a fan of the sweet and salty combo. I might have to try making these this year!! Seriously, how are you able to work full time, take care of 2 little people, recover from surgery, and do all this baking and crafting????? I work and take care of 1 little persona and I can't do the rest of it! That dessert looks yummy! I made these tonight (sans peanut butter) with my kiddos tonight for teacher gifts — so easy and the kids thought it was a super fun recipe (while I blocked all attempts at 2nd degree tongue burns!). Thank you! I make something very similar to those saltine toffees and just shared this morning on my blog, too funny 🙂 I'll have to try your recipe out next time! A party with 816 cookies involved sounds like a party to me!